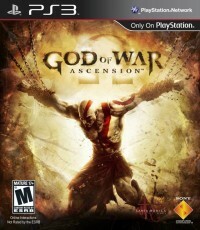 Kratos’ vengeful story has been told for over ten years now, beginning with the original God of War and continuing on through side installments on the PSP to the ultimate conclusion on the PS3. Kratos’ past has always been the focal point of the series, with gamers getting a glimpse of how Kratos became an ash-skinned killing machine who has blades chained to his arms and a hatred for the Gods that betrayed him. So why is it, that for a game that goes as far into the past as one can go with Kratos’ story, that Ascension feels nothing more but a lackluster attempt at fleshing out an already concluded and descriptive storyline. Although Ascension still delivers mightily in the amount of blood that gets strewn across the screen and the countless horrific ways Kratos dispatches his foes, this isn’t the same God of War game you have come to love over the years. Ascension tells the story of how Kratos became the Ghost of Sparta, and how he ultimately begins his ascent to dethrone Ares, the current God of War. Kratos, who ultimately becomes enraged with Ares after he mistakenly kills his own family and other innocent lives, vows to get revenge on the God (who wouldn’t). But the story that is being told has already been done before, seemingly better, in the previous five games that came before it. We have learned in great detail how Kratos became a demi-god, how he got the powers necessary to defeat a God, and how he became the pastey, blade wielding warrior we all know. So Ascension’s story often tries to teach you new things about Kratos, but ultimately fails to hit any ideas home. The new characters introduced are boring and whenever the Furies are introduced in the game I often thought to myself when I can get rid of them so the real badass boss of the game would make his appearance, which painfully, never does. What are left are you drudging along in a half-baked story trying to figure out just what the heck is going on half the time. Ascension tries to mask the awful storytelling by delivering fast-paced action sequences, and the opening fight against the monstrous Hecatonchires is no exception. A brooding Titan with 100 arms, the Hecatonchires was imprisoned by the Furies for breaking a blood oath with the Gods, a message to all those who ever want to go back on their word. The developers want you to fear the Furies, to cower in their presence, but once you see who they truly are, half naked swimsuit models who would be more at home at a cosplay convention than Greek mythology, you truly realize how harmless and completely unmenacing these enemies truly are. They constantly interrupt Kratos’ mission to remind him that “your vengeance is at an end” or “you will not succeed.” Intimidating words from any creature strong enough to enslave a Titan, but all they ever do is just enrage Kratos even more before they are chased off. What’s the point? If these three fem models are strong enough to take down a hundred –armed Titan, why do they have so much trouble taking down one warrior who hasn’t even reached his full God-like powers yet? Other confusing story segments such as constantly shifting to flashbacks to tell of past events is taxing, considering the point of Ascension is to flesh out the future titles of the series. Watching a flashback in a prequel just adds to the already moot point of how disappointing the story truly was. Story aside, Kratos still feels like a badass and Ascension delivers the goods in terms of combat. Since Kratos’ adventure is just beginning his arsenal might be a bit lacking, so his repertoire consists of only his Blades of Chaos and a few other weapons scattered around the world. These World Weapons consist of a sword to slice down enemies, a shield to block attacks or a javelin to rain down fire from above. You can pick these weapons up at any point during the game and carry one on you until it gets discarded. These weapons help break up some of the monotony of combat by giving players new options to explore, but like the previous games in the series, you will often find yourself going back to your own blades, since using those is the most fun and often most effective. The Blades of Chaos in Ascension have four unique abilities that can be grafted onto them for different abilities. The first skill you acquire, Fire of Ares, coats your blades in fire that can eventually burn enemies when upgraded to the fullest. The other abilities; freezing enemies, electrocuting them or unleashing angry undead souls to fight alongside you, offer a series of strategy in battle as to which one to properly use. Each magic ability can be upgrading numerous times to unlock new, more powerful attacks and ultimately a final magic attack that creates a giant area of effect explosion. The idea that upgrading each individual elemental attack individually makes you think of how to allocate your points effectively, and not relying on spamming magic like in previous games. Even so, I really only found myself using the fire and souls abilities on my blades, as utilizing the massive fire ability and having souls fight alongside you is all you ever really need to successfully win every battle. Switching to each elemental form is as simple as pressing a direction on the D Pad, and stringing together different combos with various styles of moves are satisfying to master. Successfully hitting combos and dodging enemies builds up a Rage Meter that, when full, unleashes even more powerful attacks that could have you clearing out hordes of enemies in seconds. New special items, such as the ability to slow down enemies or unleashing the help of a friendly ally, also help change the flow of battle in your favor when the game unmercifully throws hordes of enemies at you at once. Being able to control the tide of the battle is extremely gratifying in the later levels when you truly do feel like an ultimately badass with your fancy gadgets and elemental magic. The only downside to the combat is the fact that the parry button is now a two button process, meaning you have to push L1 and Square before you can successfully block an enemies attack. This rarely works, often forcing Kratos to jump erratically in battle. A weird choice to reconfigure considering parrying attacks is a key staple to surviving some battles later on in the game. Ascension still plays and looks great. 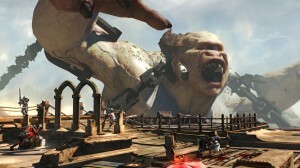 The God of War series has always maintained a high quality of action and graphical prowess to other games in the same genre. Ascension doesn’t fade back the gore or amount of enemies it throws at you while looking stunning in the process. The new enemy designs are worth taking note, as the monstrous juggernauts, massive beasts with elephant heads, look ferocious in battle, spewing spit as they flail their weapons at you. The scale of Ascension is great as well, with some of the levels taking up so much space, the game has to pan out for you to truly take in the scenery. The beginning level fighting atop the Hecatonchires and the later levels in the Statue of Apollo are some of the best designed levels in the series, constantly evolving feats that will highlight the epic scale of the God of War series. The problem with these moments is that they are far and few between, and while the design of these levels are phenomenal, some of the early segments that have you riding aboard giant snakes in a canyon or riding down slides are just baffling. Even more confusing was the addition of multiplayer, something the developers said fans were clamoring to have for a long time now. That might be true, but the way multiplayer works in Ascension is hardly engaging enough for anyone to spend any significant amount of time with it. Players can choose from one of four classes that pledges allegiance to a God. 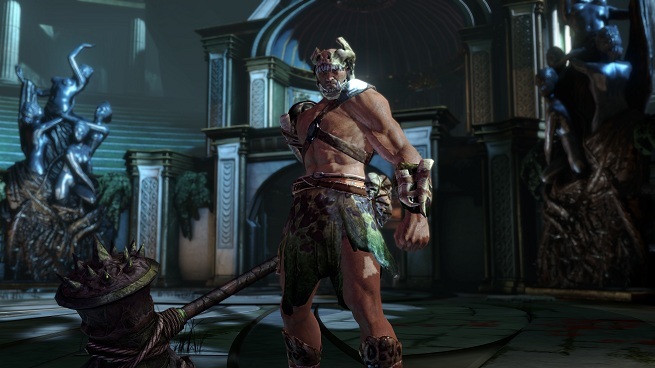 Players who prefer to go all-in in battle should choose Ares for his combat abilities while combatants who want to stand back and unleash magic should pick Zeus to honor. It’s an interesting concept and makes you stop and think of the pros and cons of each class before heading into battle. The problem is that none of the classes you choose simply feel different from one another and you will find that all battles in multiplayer really require nothing more than button mashing. Whoever can out press their opponent typically wins. There are some neat moments such as giant enemies sprouting up to knock you down as you roam around and various special weapons scattered about, but since the combat itself is so simple and lacking the multiplayer never really gets a chance to truly shine. God of War has always been the consummate single player experience, and adding a half-baked multiplayer component (similar to Bioshock 2) was almost insulting. 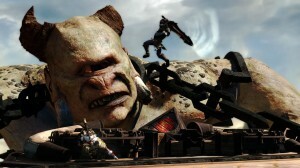 Kratos’ story of rage and vengeance has always been fun to witness but perhaps it is time for him to truly take a break. Ascension’s failed attempt at a cohesive prequel story and lackadaisical multiplayer really are disappointments for a series known to deliver exceptional products. The combat is the God of War you love and the game still looks better than any other game on the PS3, but Ascension’s “over-the-top” moments are often overlooked by the boring and often confusing level designs scattered about. Perhaps it is time for Kratos to take off his sandals and go back to Greece for a few years, as fans deserve better than what Ascension brought to the table.